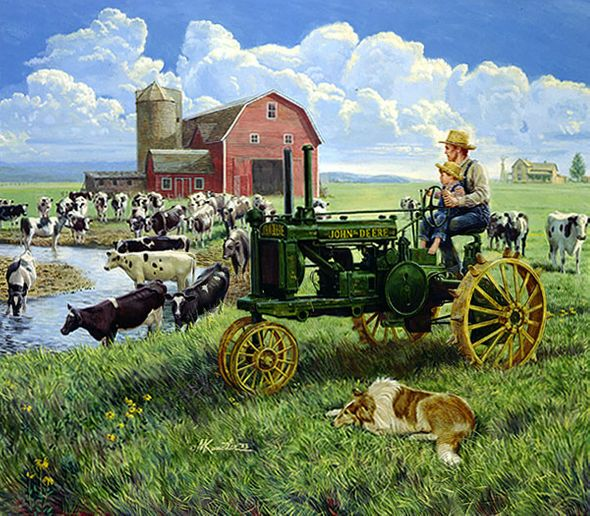 Mort Künstler Hand Signed and Numbered Limited Edition Canvas Giclee:" Days of Splendor - John Deere"
Edition Size: Artist Signed and Numbered with COA included. Image Dimensions: 20" x 23" , 26" x 30", 30" x 34" and 37" x 42". About the Art: As a teenager in Vermont, John Deere learned the blacksmith trade. During the Depression, Deere moved to the mid-west with the hope of prosperity. This painting by Mort Künstler, Days of Splendor, shows the Deere & Company GP Wide Tread Tractor, made in the 1930s.